Sheila’s home has a very special story. The land belonged to her family and what is now a beautiful space was once a small cowshed. Sheila is a carpenter (as well as a teacher of carpentry skills) and over the course of 10 years, with the help of assistants, contractors, and a lot of work from the woman herself, Sheila’s on the Sheep’s Head was born! The cow shed became what is now known as The Cottage. 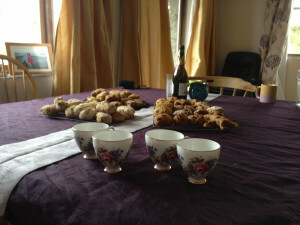 Take a look through Sheila’s book on arrival to see for yourself the amazing transformation. In 2011 the West Wing was added on to create space for retreats. You won’t find Sheila’s place in any guidebook, but we do promise that your stay here will be unique and comfortable. And while her space isn’t officially star-rated we give it a 100,000…because that’s what you can see at night from her balcony. This back bedroom in the West Wing is bright and cheerful with mountain views. It was created as the original master bedroom, containing 2 single beds and one queen-sized bed. It is large, bright, and comfortable, with a bathroom just down the hall. With a bathroom en suite, this cheerful little room accommodates 2. One double and one single bed, an antique wooden armoire, and gorgeous ocean views round out the second bedroom in the West Wing. This front bedroom in the Cottage comes with views of the sea and mountains. It sleeps 2, with a double and single bed. Bright, with wooden floors, and it’s own little secret entrance, you can even climb into the windowsill and watch the world go by. One day I was having coffee at Jim’s Coffee House near Glengarriff and decided to go for a walk afterwards and enjoy the sun. I noticed there was a small road nearby with a sign pointing to a beach. Being an explorer type I walked on down there and discovered the home you see above! I liked it immediately. Years later I found out it was a holiday home for rent. The house sits right above Glengarriff Harbor and you can touch salt water in less than 2 minutes walking. 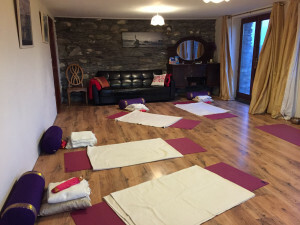 The yoga area looks out onto the sea and oak woodlands that border its’ rocky beaches. It is set on 1 acre of mature, lush gardens to the front and rear and there is a terraced aspect which affords spectacular views to the sea and islands. The house is 3600 square ft and features beautiful oak beams and oak floors. Located at the front of the house, this master bedroom accommodates 2 single people or 1 couple sharing and has an en-suite bathroom with a shower. The room is spacious and has sliding doors that take you out onto our own veranda with table and chairs. An extra charge of $100 will apply per person for this room. 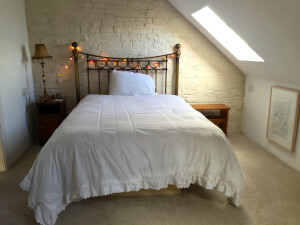 Named after a beautiful woman with a wild soul who has come on 2 Retreat to Ireland’s, this room accommodates 2 single people or 1 couple sharing and has an en-suite bathroom with a clawfoot bathtub. 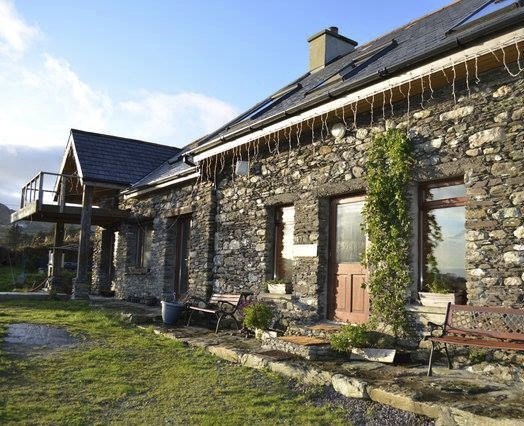 The room looks out into the courtyard and has lots of storage capacity for luggage and all the treasures you find combing the beaches and hedgerows of Ireland. An extra charge of $50 per person will apply for this room. 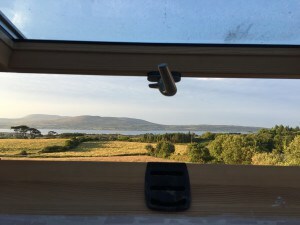 Looking out towards Glengarriff harbor this room accommodates 1 single person or a couple sharing and has an en-suite bathroom with clawfoot bathtub. Sliding doors exit onto the back patio and it’s a quick walk down to the beach for a morning walk. An extra charge of $100 will apply for this room. 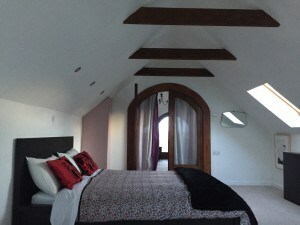 This room accommodates 3 single people with twin beds and an en-suite bathroom with shower for sharing. Two very large skylights on the wall open to reveal a gorgeous view of Glengarriff harbor. It is the only upstairs room and while shared has a nice sense of privacy from the rest of the house. No extra charge will be included for this room.